Kadena’s Soukan Taiko drum group performs at the fair. This event has been cancelled because of inclement weather! Kadena Town organizes its annual business fair for the 10th time this weekend at Kadena Road Station at Yara on the north side of the air base. At the event, Okinawa Churaumi Aquarium will display creatures from the ocean in a small aquarium they set up on the premises. Seven Michi-no-Eki from around the island will join the festival to highlight their own local specialties. The seven are Kadena, Ogimi, Kunigami, Yomitan, Itoman, Ginoza, and Nago. Besides products from Kadena Town businesses, the Kadena Fair this year features stands of six road stations from around the island promoting their local specialties. Burger shops ’Tenpusu’ from Ginoza and ‘3S Cafe’ from Kadena, which won the Ginoza Burger Festival grand prizes in 2014 and 2015 respectively, will set up stores at the fair. And Motobu Town will send to the fair frozen acerola juice, which won the first prize in the National Nippon Local Snack Ranking Contest in Tokyo. 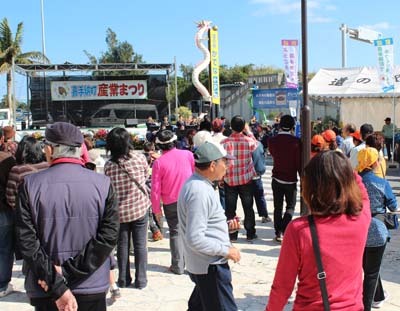 A tuna filleting performance is scheduled for Sunday, and the first 1,000 visitors are given lottery tickets with every ¥500 purchase. 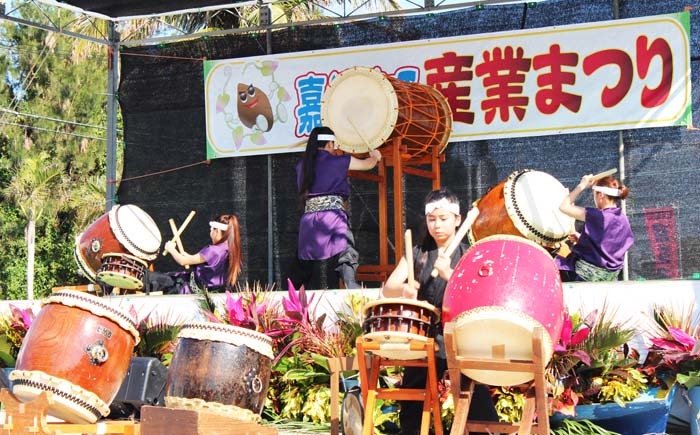 The entertainment includes a brass band performance, Soukan Taiko Show, Ryukyu Dragon Pro-wrestling performance and Yoshimoto comedy show on Saturday. On Sunday there is street dance, comedy and live music. And as in all local fairs, local goods that are on exhibition are also on sale throughout the event. The fair is open on Jan. 23rd and 24th from noon to 17:00 at Michi-no-Eki Kadena at 1026-3, Yara, Kadena Town. Admission to the event is free.